PAZA has been busy the past few months but due to Internet access problems there has been a 2 month lag in the blog postings. December’s headliner was that the rain began falling regularly. Cool overcast skies finally replaced the merciless summer sun. The fields of spindly corn were in agony trying to survive in soil more akin to cement than a growing medium. 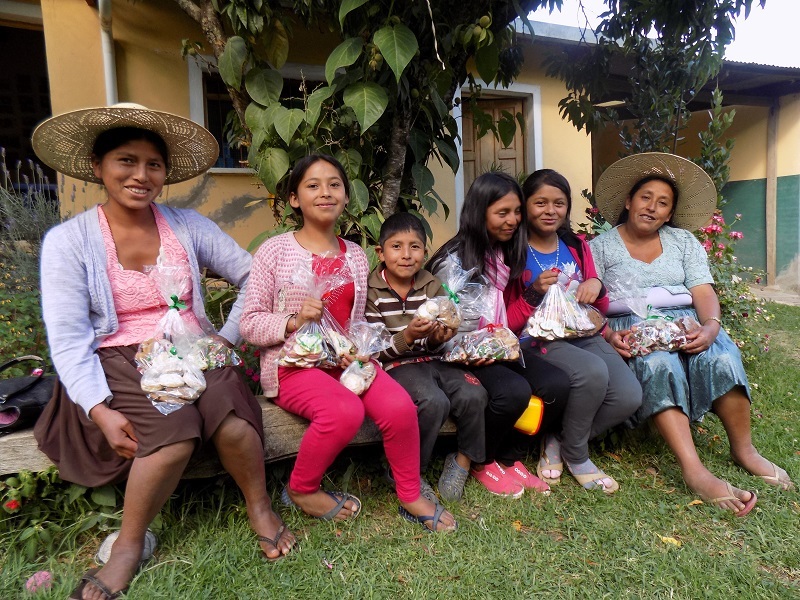 The 5 Club de Artesanas (CdA) members who are enrolled in this summer vacation session spent the week prior to Christmas baking and decorating dozens of cookies. They took home a festive variety bag to share with their families. On the morning of Christmas Eve the 3 chicas formed animal figures out of a sweet bread dough to adorn and take home. The father of Abigail and Nelva was so impressed he splurged on coffee to accompany the treat. 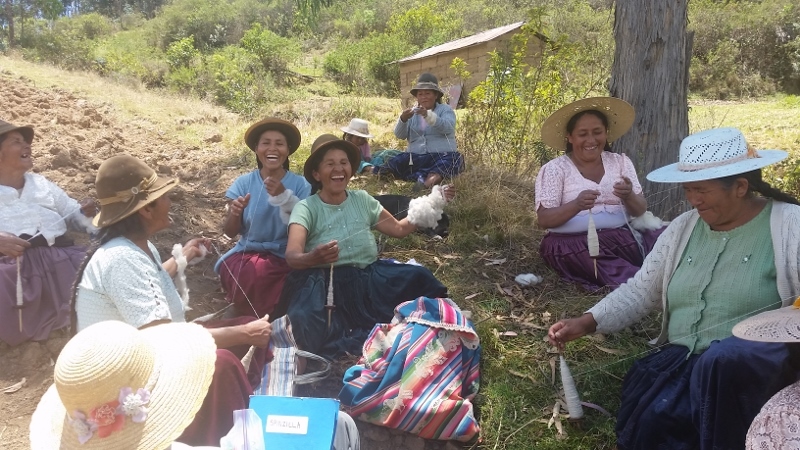 Although coffee grows in Bolivia it is not a customary drink in Independencia and it is the instant variety that prevails. All 3 chicas said enjoying the baked goods was all that their families did in celebration of the holidays. 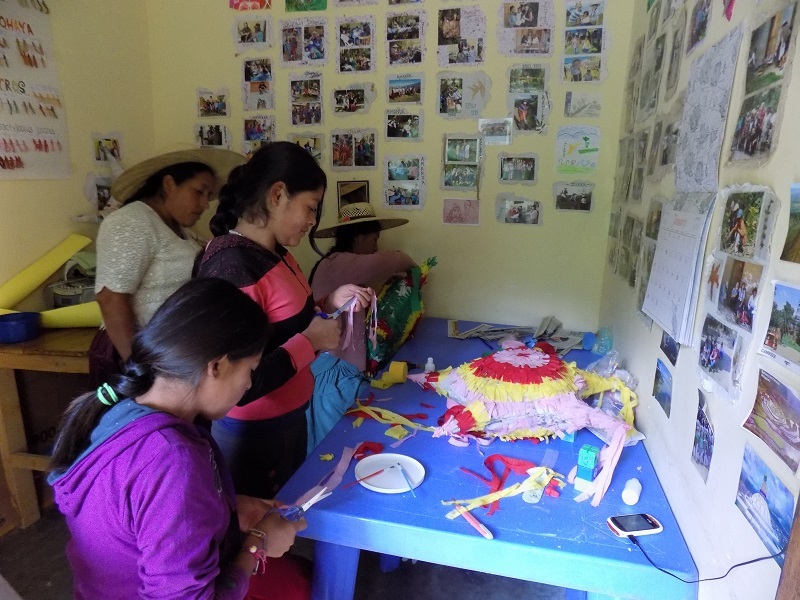 After Christmas the CdA members spent weeks working on paper maché piñatas for their families using a star shaped balloon as a mold. 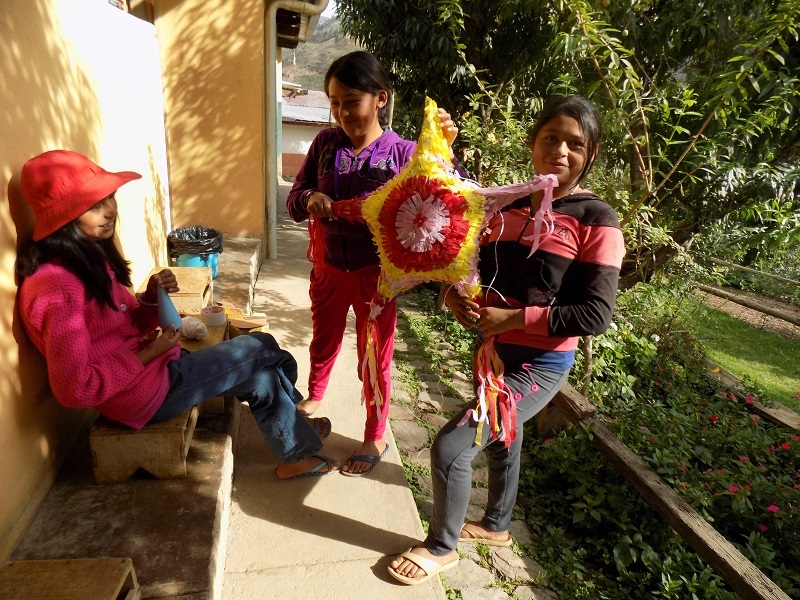 The piñatas are not a Bolivian tradition, but all knew of them. Creating a burro shaped piñata for the upcoming Fiesta de Don Jorge was a group project. PAZA rarely gifts cash to weavers or the CdA members. An exception was made for 12 year old CdA member, Veronica. She cancelled the plan to bake her birthday cake on Christmas Day in the PAZA kitchen because she had to work. Her father was going to take her to Cochabamba for dental care but the family was strapped for cash so she found a weekend job cleaning the public bathroom at the market. Not complaining but with a swollen jaw and expression that was heart rending she asked to reschedule the baking of her birthday cake. Her face lit up in a smile when PAZA gifted her 100 Bs. ($14.50) to cover the roundtrip bus fare to Cochabamba for her and her father. They spent almost a week in Cochabamba while she recovered from having 2 molars surgically removed. All Club members get to bake a cake to take home for their birthday so Veronica will bake and share a belated birthday cake and piñata bashing with her siblings. Her piñata is a work of art, she spent 4 days decorating it with pleated streamers and rosettes, so maybe they won´t be bashing her piñata. PAZA gifts toothbrushes regularly to its members. There seems to be headway being made in the understanding of preventative dental care, which is a good thing considering the baked goods and sweets that are part of all celebrations and the CdA activities. 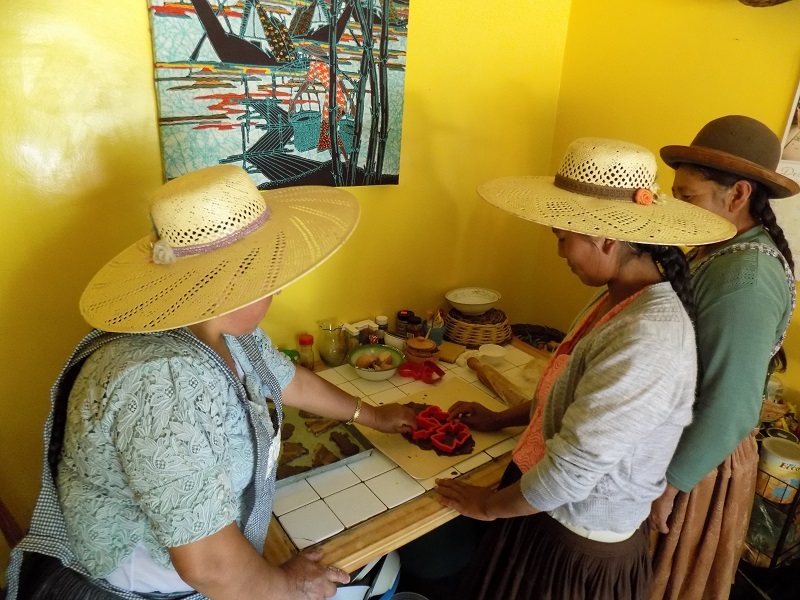 New Year´s Day fell on a Sunday, so Doña Máxima and Dorinda invited the Huancarani weavers to drop by the PAZA workshop for api and pastel. Api is made by dissolving powdered corn in boiling water spiced with cinnamon and cloves and sweetened with sugar. A pastel is bread dough with a cheese filling that is rolled thin and deep-fried so that it puffs up and the cheese melts into gooey yumminess. A sprinkling of powdered sugar completes the confection. 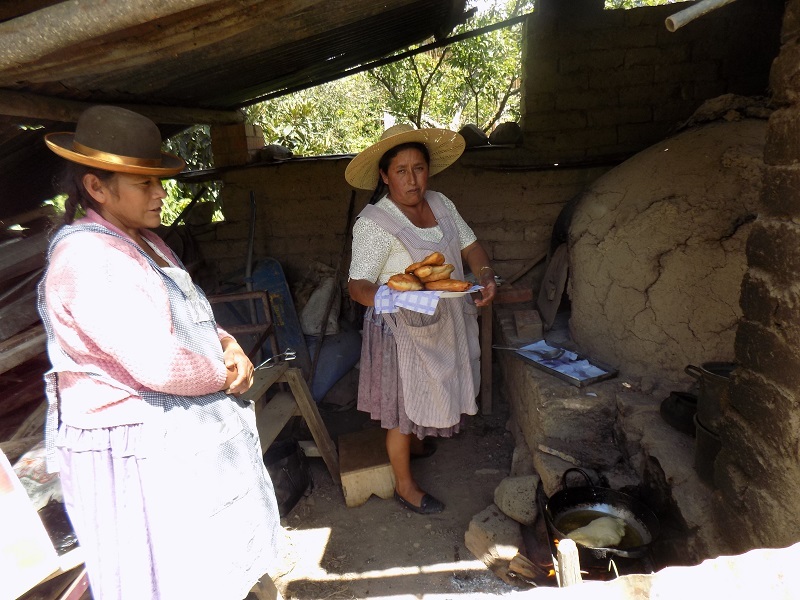 Doña Maxima and Doña Antonia built a fire under the outdoor grill to fry the pasteles. 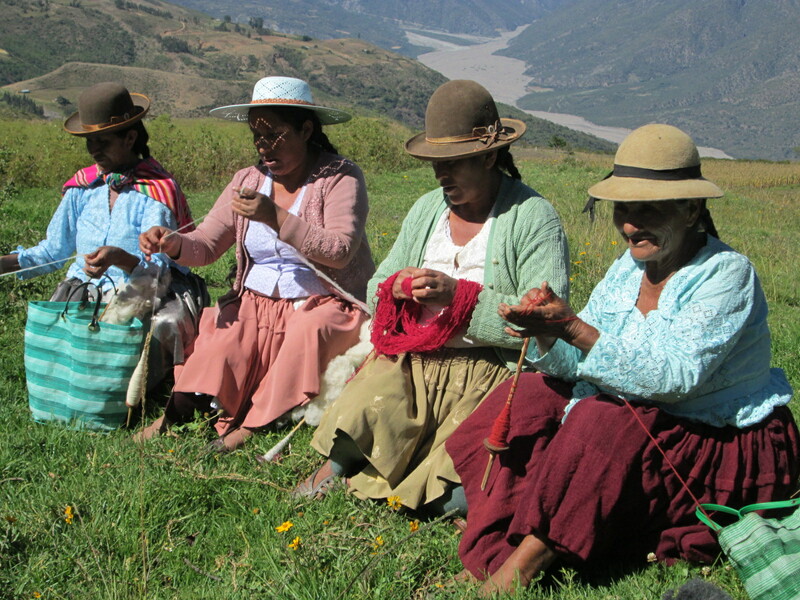 Huancarani weavers arrived around the same time so all sat to sip, eat, and chat. The comfortable camaraderie on a fresh cool sunny morning was the perfect way to ring in the New Year.